Should Mike McCarthy Be Extended? According to Bob McGinn of the Milwaukee Journal Sentinel, Packers President Mark Murphy has approached head coach Mike McCarthy about a contract extension this offseason. This comes as a surprise, since McCarthy still has two more seasons remaining on his current contract. 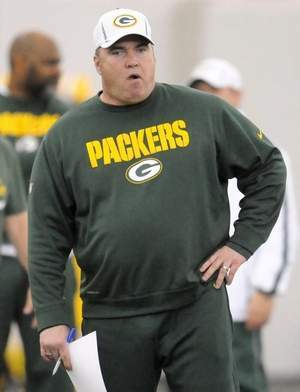 There is no question that McCarthy should be Green Bay’s head coach for as long as he desires. He has a career record of 82-45-1 with four division championships and one Super Bowl championship. At worst McCarthy is one of the 10 best coaches in the NFL, and at best he is one of the five greatest. However, with two years left on the deal there does not need to be a rush to extend him. As McGinn mentioned, the status of general manager is a big reason why. Thompson’s contract does not expire until after the 2016 NFL Draft, but there is doubt about how long Thompson will have the desire to keep his grueling job. He is 61 years old and did not appear to be in the best shape health wise at his last press conference. It could mean nothing, but it was a reminder that Thompson has been at this job for a long time and isn’t getting any younger. McCarthy and Thompson are the longest NFL head coach and GM tandem with nine years together. That is an eternity for a league where jobs are on the line every season. Coaches and general managers are disposed of with little regard. One of the reasons they have been here for so long is that they work so well together. McCarthy understands that Thompson is not going to go out and sign a bunch of big money veteran free agents. McCarthy has a huge chore coaching up so many young players every season and does it very well. Some coaches would be very frustrated by Thompson’s style since they are always thinking about winning now because their jobs are always on the line. Rex Ryan in New York expressed frustration about John Idzik’s lack of free agent signings this offseason. McCarthy has never complained like that. It could be a risk to extend McCarthy now and have Thompson retire in the near future since continuity is so important. A new GM usually likes to pick his own coach, no matter who the incumbent is. When a new GM keeps the incumbent coach it usually doesn’t last very long. Ted Thompson firing Mike Sherman after Thompson’s first year on the job would be an example of that. Thompson and Sherman never got along with each other. However, it has been rumored that Seattle GM John Schneider could be the replacement for Thompson. Pete Carroll still has final say over everything in Seattle, and it has been rumored that Schneider’s dream job has always been to be the GM of the Packers. It is far from a certainty that the Seahawks would ever allow Schneider to go to Green Bay or if his contract allows him to do so. Thus, extending McCarthy without knowing Thompson’s future is a risk. It’s a risk that Murphy will have to continue to weigh as the organization moves forward. This entry was posted in Matt Bove, Packers 2014 - 2015 Season. Bookmark the permalink. Of course he should have his contract extended. His resume alone warrants it. The fact he would be on the job market for approximately 3 seconds before being swooped up by another team only solidifies the fact he should be. And the Packers brass will do anything they can to keep the Thompson/McCarthy/Rodgers trio together as long as they can. So let’s speculate for just a minute-if the Packers were to foolishly let McCarthy walk, who would they replace him with? If Thompson stays as GM for more than the two left,McCarthy will no doubt be extended.If Thompson is leaning or perhaps already gave credence to his leaving after 2016,then the challenge is to A)Hire from within to ensure that 2/3 of the trio remains intact,B)Hire back one of the three that have left…Schneider,McKenzie or Dorsey C)promote McCarthy to GM and hire from within the new HC or one who actually understands and agrees with the Packer system since it is unique. Otherwise,instability arises and wreaks havoc and a revolving door is installed on either one,two or all three jobs…GM,HC,QB…yes even Rodgers could want out ‘if’…. I think that the GM situation is a little overblown. The guys who are put in as perspective GM’s, notably John Schneider were here when McCarthy was hired. Yes there is something to be said for letting a GM “pick his own coach” but I really believe that the Packers GM situation comes down to if John Schneider wants the job. If he does not it will be Eliot Wolf. I would consider Trent Baalke a long shot candidate for the job, despite his Wisconsin ties. McCarthy has done so much for this organization and his personality is stamped on this team. That was evident by their no excuse never say die attitude that you saw during 2013, even without their best player. They had every reason to quit, but did not. The Packers should consider themselves very lucky to have MM as their head coach, and for the foreseeable future.